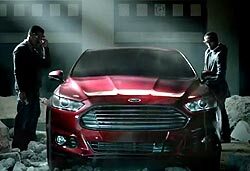 Ford has launched a campaign for the new Fusion sedan that brings the car out of a block of concrete, with laser beams assisting, all to a recitation of the poem "The Rose that Grew from Concrete," by the late Tupac Shakur. The TV, radio and Web campaign, via Uniworld Group, is directed at African-Americans, and stars Andre Royo of HBO's "The Wire." Digital elements include a series of web videos in which Ford product-development team members talk about the vehicle's design. The Web videos are also on the Ford Fusion YouTube channel and Ford Fusion Facebook page. The TV ad, on BET, TV One and NBA on TNT, has Royo strolling into an open abandoned atrium, with a set of weird laser guns. Lots of cool sci-fi effects ensue, with the car emerging as a concrete sculpture that becomes real. The print ads are in Essence and Jet. Says Shawn Thompson, Ford multicultural marketing manager: "The campaign was inspired more by the poem than the artist, because there is strong connection between the image of the rose that grew from concrete, and the idea of breaking through." She adds that this idea aligns with the general market creative around the "Go Further" tag. Those ads suggest that Fusion stands out from the mid-sized crowd, as it shows traffic jams of cars vanishing, as they are replaced by one car, the Fusion. Thompson says the “Rose” ad has gotten 14,000 views so far, "and we really haven't pushed it.” The TV ad is in :60 and :30 versions, and, per Thompson, will run for the next nine months, with extensions into experiential programs. During the summer, she says, Ford was title sponsor of Steve Harvey's Ford Hoodie Awards, “where we gave a Fusion to a community leader. This Monday is another contest on the Steve Harvey radio hour, and more to come," she says. The effort also includes a digital component on BET's social-media room. "We are definitely going to focus on experiential," says Thompson, adding that upcoming programs will include partnerships with Tom Joyner, and other personalities. "We are negotiating those right now." The agency and Ford's multicultural division are also continuing programs around Focus and Escape. The Uniworld-helmed general market campaign for the latter won an Association of National Advertisers Multicultural ad award this year.